ME TOO, Carrie! I absolutely love music! I think it is the most inspiring & motivational thing in the world!!! There is always such a wonderful message through a song! I can cry at the drop of a hat most anytime, but if there is music in the mix, I will ALWAYS cry! It just moves me! I may not can sing well, but I'm a HUGE fan of music. I'm one of those 'gals' that will sing while the windows are down and the sunroof back in the car, sing in the shower, sing to my litte boys. I also 'rock' out while I'm cleaning the house. LOL!! (I only play it LOUD when the boys aren't in the car). :) American Idol isn't anywhere in my future, but there is always a chance with DWTS. THAT I could do! HAHAHA!! Favorite song....the list is ENDLESS!!! Hope you're doing well. I love music, too and my girls also love it. This is a hard question, I've been to so many great concerts from all genres of music!! But I haven't seen Third Day yet and they're one of my favorite groups so I'd love to see them. I have never been to concert before! That is so sad! I think it would have been fun to go to a Michael Jackson concert to see him dance! Thanks for stopping by my blog! Have a great Friday! I was at a loss (I used to be a concert junkie. I'd love to see John Mayer again... but I wouldn't die if I didn't)...until I read Natalie's comment. I would have to concur, I would have loved to see MJ in concert. I would also love to see Brian Littrell (of Backstreet Boy fame) perform the songs from his album Welcome Home. Hi thanks for stopping by mine. If I could see anyone in concert it would be Billy Joel. I always wanted to see him in concert but never got the chance. I hope he comes around again, I really regret that I didn't get to see him. He was always the most talented. I think music is one of the most important things in everyone's life. My earliest memories of music is from the 50's and 60's when my older sister's were teenagers. I enjoy most music as long as it has rhythm. I think much of the music now days is noise without a beat which is why kids jump up and down to it instead of dance. My favorite all time song would have to be Pacabel's Canon. I love to see The Dead (Grateful Dead minus Jerry), Allman Brothers and really would LOVE to see the Rolling Stones!!! Oh, and Warren Haynes by far one of my favs! Jack Johnson, I never grow tired of any of his music, such happy music. 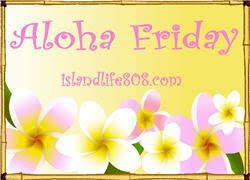 thanks for stopping by and welcome to aloha friday! I LOVE going to concerts!! I want to go see Pearl Jam again (I have already seen them twice). I love music! And I love listening to it. But I hardly ever go to concerts. Off the top of my head I do not know who I would liked to see. If I had the money and a sitter I would probably go to see a Broadway musical. Your header is most loving and adorable! I can't say who I'd like to see in concert. Maybe SADE.